clan tartans cannot claim great antiquity, 'District' tartans, those named after an area rather than a clan, have a much stronger chance of doing so. Certainly logic would support the idea of certain patterns selling better than others and thereby becoming common in the areas where they were produced. This would also go far towards the oft-quoted statement by Martin Martin, in his Description of the Western Islands of Scotland of c. 1695 that a man's residence was detectable by his plaid. 2000, Polygon at Edinburgh, being an imprint of Edinburgh University Press. Gunn tartans historically seem unlikely to have existed. Named tartans seem to have been created in the main around the 1820s - It was Scott who, to add “aboriginal” colour to George IV’s “jaunt” to Edinburgh in 1822, invented the cult of the clan tartan (“the ancient Highland costume”) – arguably one of his finer works of fiction. I note - In 1842 Queen Victoria and Prince Albert visited Scotland. The young couple fell in love with the country , and tartan, which had been simmering for 20 years since the visit of King George IV, bubbled up again. The brothers John and Charles Allen, calling themselves Sobieski Stuart published Vestiarium Scoticum, which introduced 75 new tartans to the delight of the trade. It is worth noting that the Vestiarium Scoticum mentioned above by the tartan authority does not point out that the work is generally considered fiction. D. C. Stewart would later go on to author, with J. C. Thompson, Scotland's Forged Tartans, published in 1980. This book is a critical examination of the Vestiarium Scoticum and the historical claims of the Stuart brothers. The undeniable conclusion of the authors is that the work is a hoax. This position is universally held by tartan scholars today. While some of the tartans illustrated in this reference can be shown to have been in use prior to the publication of the Vestiarium, the majority were likely invented new... Indeed, in many cases the Vestiarium gives tartans for clans and families which are no longer in use, including Forbes, Gunn, and Graham. I have no idea for how long the tartan was used. 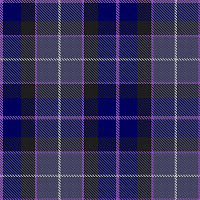 'The information held within The Scottish Register of Tartans for the "Commonwealth Games" tartan is shown below.